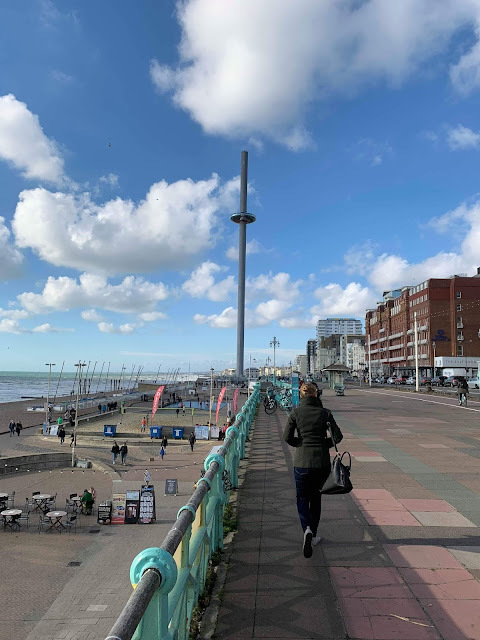 When my teenage daughter added Brighton to her list of possible universities for 2019 I got very excited about the uni open day. 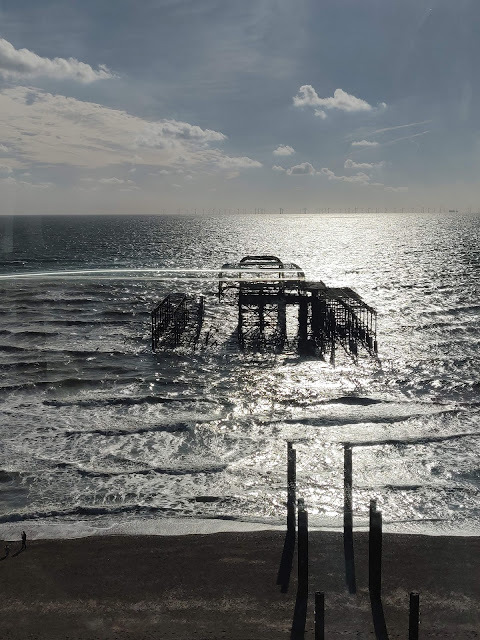 I've never been to Brighton, unless you count a camping trip with friends years ago when we mostly stayed round our campfire in a field just outside the city. 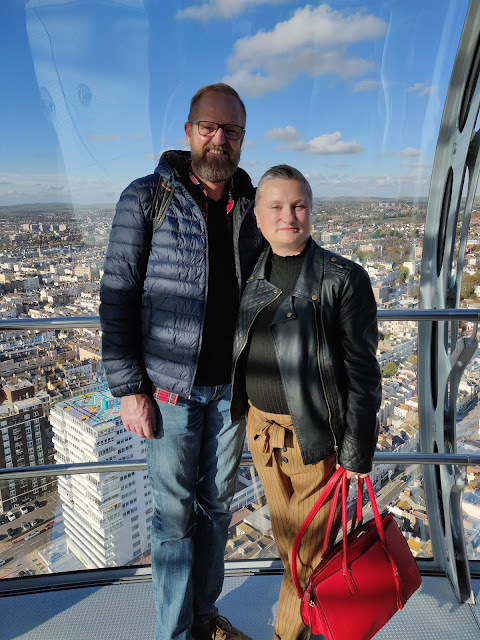 This time we booked a budget hotel and since it was the eve of her 18th birthday we invited her eldest sibling and the future daughter in law (FDIL) to join us - they live not too far away in Portsmouth. I envisaged shopping, eating, drinking.......oh and I thought we might even squeeze in a visit to the university too! 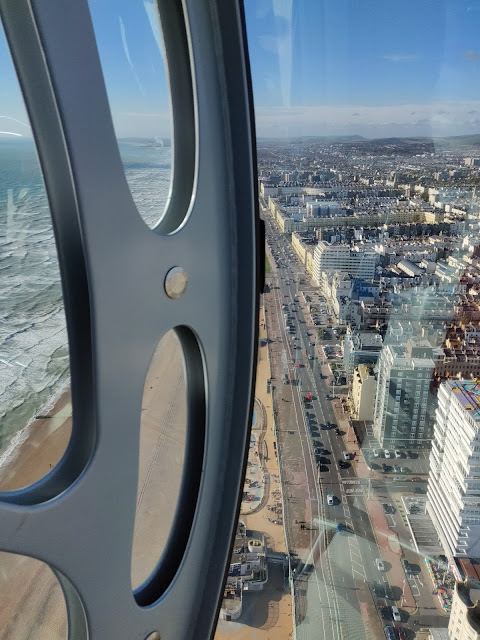 What I didn't expect was a trip 450 feet into the sky above Brighton seafront on the British Airways i360 attraction. Turned out that not only did my daughter get a discount voucher in her uni goodie bag but my son and the FDIL had been gifted the funds to go on the i360 next time they visited Brighton. Add to that an extra 15% discount from our hotel off the entrance cost and it seemed the stars had aligned to get me on it. Bizarrely although I met my husband through our mutual hobby of hot air ballooning I'm not generally keen on heights. I was nervous on the London Eye and have yet to brave the Spinnaker Tower at Portsmouth's Gunwharf Quays. 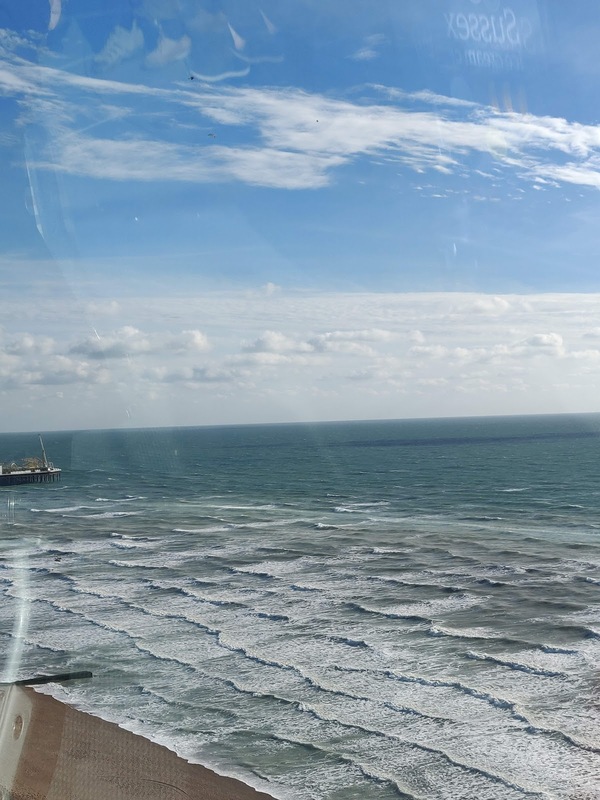 However it seemed churlish (and a little lonely) to stay on terra firma while they rode high so I made an impulsive decision at the ticket office and added myself to the party. So did I regret that decision? Not at all! After walking into the ticket booth at the base of the attraction we were delighted to discover we didn't have to wait long to ride. In fact despite it being a lovely sunny Saturday at the end of half term we only had about 35 minutes to wait. We meandered round the gift shop in the beach building after arriving more than the recommended 20 minutes before our booked slot, then after a bag search and scan with a metal detector (very reassuring) we were shown into a waiting area with a small play area for children and a fascinating display featuring images and a video of the construction of the i360. 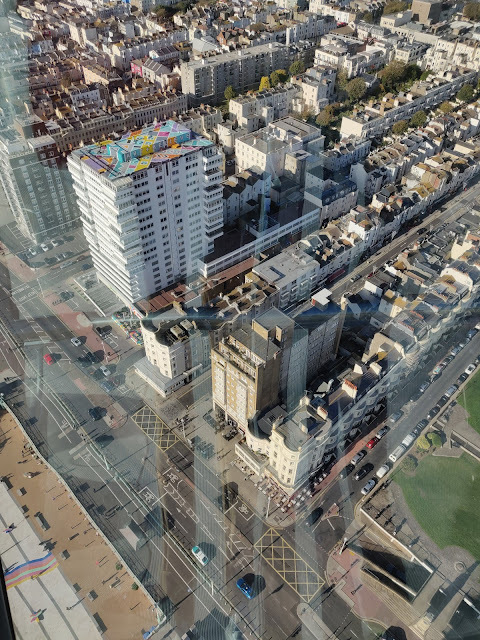 We particularly enjoyed the time lapse video showing how the tower which holds the glass viewing pod was constructed. 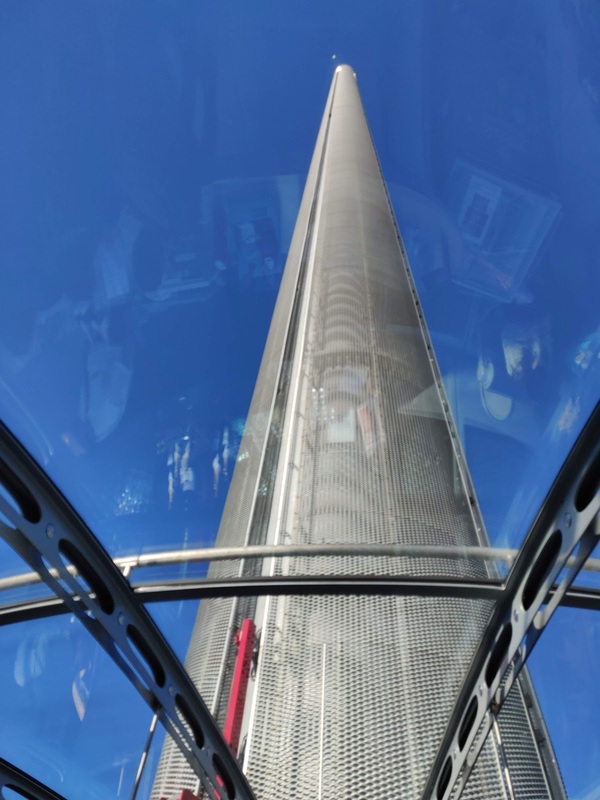 Next we walked through wide doors into the glass pod and, looking up, could see how tall the centre column is! I was nervous at first but as the pod rose slowly and smoothly upwards I realised it wasn't scary at all and happily walked around admiring the amazing views. 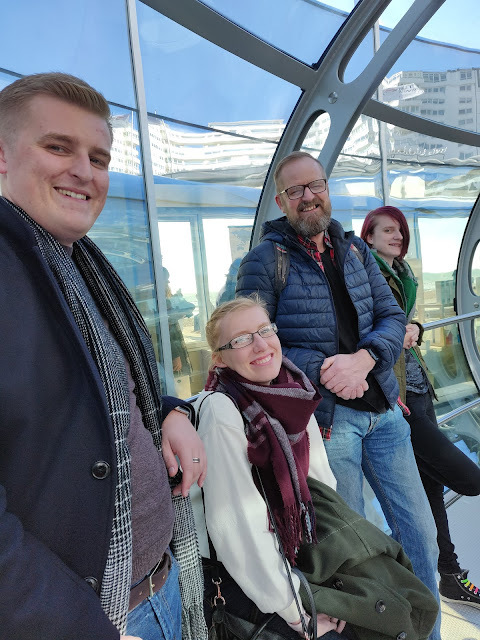 The pod is huge - around ten times the size of a London Eye capsule and up to 175 people can stand by the windows to admire the view. Mostly people wandered to make the most of the experience from all angles. There are seats for around 30 people away from the windows if you do need to sit or for any reason find you don't enjoy standing right by the windows. There's even a sky bar on board where you can enjoy tea, coffee, snacks and locally sourced alcoholic and soft drinks or even a cocktail or two. You have around 25 minutes so plenty of time to get and enjoy a drink from the in-flight crew who will also give a short commentary pointing out what you can see. You can buy a map or download an multi-lingual app which is fun to explore before and during your flight. It has a children's section too with fun facts and a treasure hunt. Is the British Airways i360 suitable for children? Totally! There were quite a few children from babies upwards on our "flight" and it was wonderful to watch one solemn toddler circling the pod constantly apparently unfazed by how high we were. During our visit we were joined by The Snowman (the character from the eponymous film) on board and children were having lots off having selfies with the frosty figure who really was "walking in the air". You can book Santa flights too and there are a whole host of other special events from yoga in the sky to a New Years Eve party planned. Check out the website for details of these, ticket prices and discounts. Yes - the i360 is fully wheelchair accessible and there are discounts for those who need a companion or carer to accompany them. There is disabled parking and wheelchair hire available. Again, head to the website for more details. Disabled visitors are advised to book in advance as there is a limit to the number of wheelchairs allowed onto each flight but visitors with disabilities do not have to pay the usual £2 per transaction booking fee. Assistance dogs are allowed as long as you are confident they won't become distressed by travelling in the pod. In a heartbeat! I'd love to take my youngest to see Santa in the sky and I'd also love to ride at dusk to see the lights of Brighton coming on. Since my daughter loved the university and hopes to study chemistry there from 2019 hopefully I will get plenty of opportunities to ride again and get to know this gorgeous, quirky, vibrant city. Disclaimer: Not a sponsored post - I just enjoyed the experience and wanted to share. Very brave. It looks fun though so maybe I will be brave as well next time I go to Brighton.